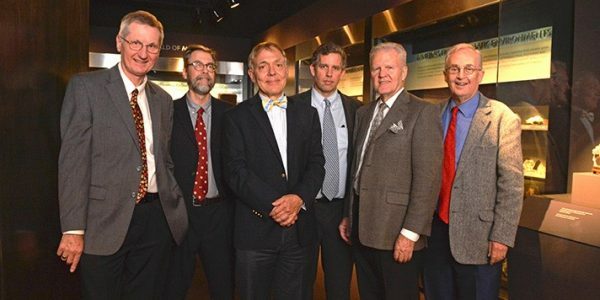 The gallery, which opens Oct. 23 as part of the Peabody Museum’s 150th anniversary celebration, represents a new approach to exhibit design at the museum — one that uses a minimal amount of signage and invites visitors to ponder the pieces on display, much as they would a painting hanging in an art museum. 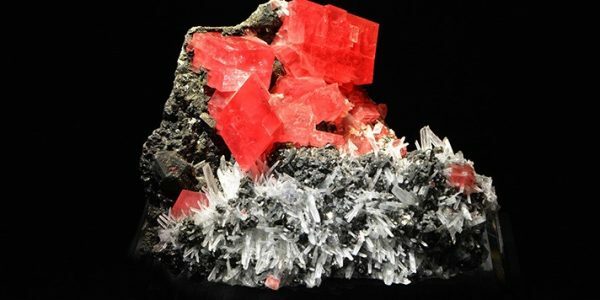 The 2,300-square-foot space, formerly the museum’s auditorium, features more than 150 minerals and gems, drawn from some of the most significant private collections in the United States. 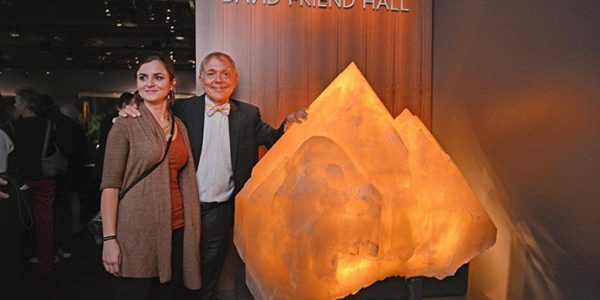 A 2,000-pound quartz crystal from Namibia, lit so it glows amber, awaits visitors just inside the gallery’s entrance. 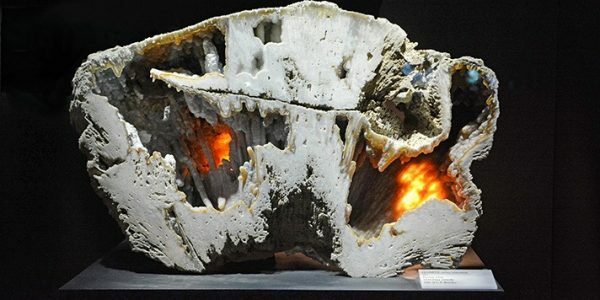 It is freestanding, and visitors are welcome to touch it. 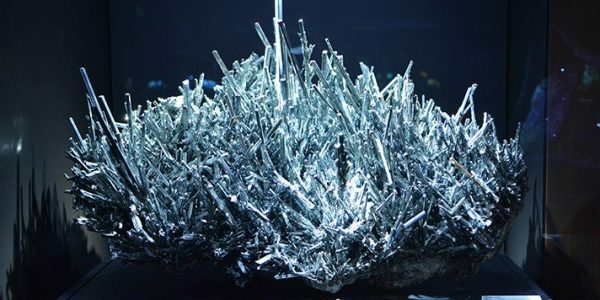 “It’s probably one of the single largest quartz crystals in the world,” said Friend, the founder and chair of Carbonite, a data security and storage company, and a longtime mineral collector and enthusiast. 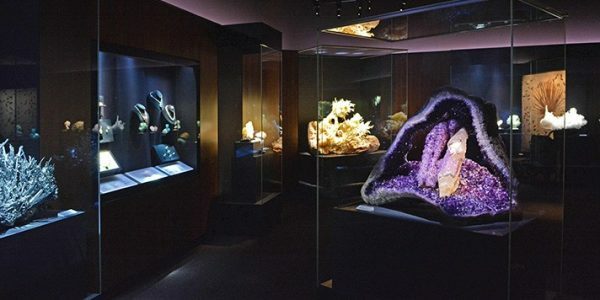 The gallery is dark and its customized lighting and glass cases are designed to highlight each specimen’s unique colors and features. To the left of the quartz specimen, deep purple amethyst crystals sparkle from within an enormous geode discovered in Uruguay. Straight ahead from the geode stands a bizarre sandstone formation called a concretion that looks as though it comes from an alien landscape. 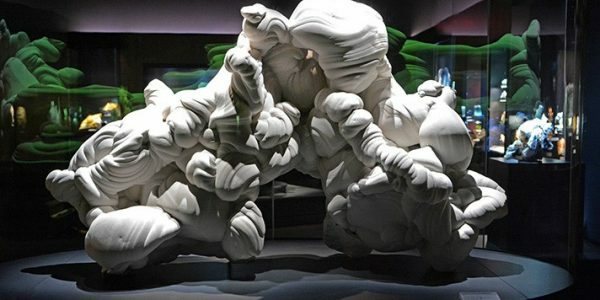 Discovered in Fontainebleau, France, the concretion has never before been exhibited in public. 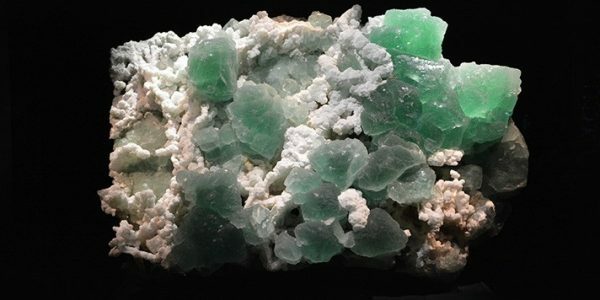 A hulking, 4,000-pound fluorite and quartz specimen from China glows lime green from its case in one of the rectangular gallery’s far corners. 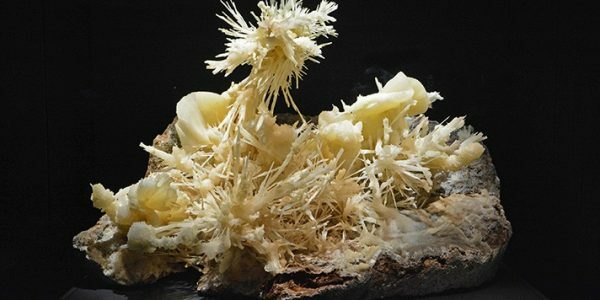 Another corner houses an aragonite specimen featuring a chaotic array of spiky white crystals. A variety of smaller specimens glitter, sparkle, and glow from glass cases built into the gallery’s walls. One case houses a collection of world-class gemstones, including a 77-carat yellow diamond and a 75-carat sapphire on short-term loan from Christie’s. “It makes the diamond ring that Richard Burton gave to Elizabeth Taylor look small,” Friend said, referencing the 68-carat diamond the actors purchased in 1969, which caused a sensation when it went on public exhibition in New York City and Chicago later that year. The Cullinan Blue Diamond Necklace, set with 243 round white diamonds and nine rare blue diamonds, the largest of which is 2.6 carats, is on loan from the Smithsonian Institution. 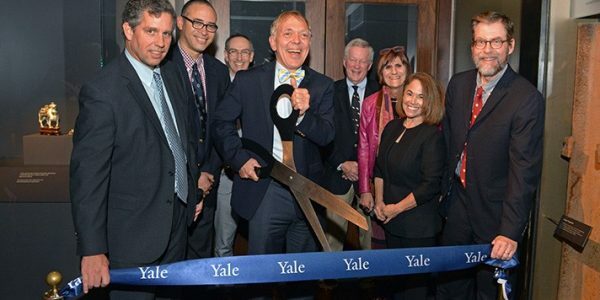 While the gallery’s aesthetic emphasizes the physical beauty of each specimen, the museum is developing a new method for sharing information about the objects on view with visitors as well as Yale faculty and students. 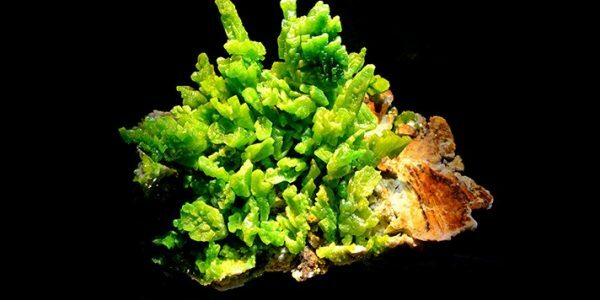 It has enlisted Leo Shimonaka, an undergraduate majoring in computer science, and Duncan Keller, a graduate student in the Department Geology and Geophysics, to develop a mobile app that will allow visitors to learn about the objects on view via their tablets or smartphones. 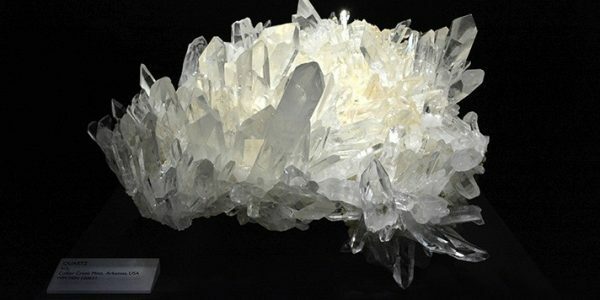 The app, which will be available once the gallery opens to the public on Oct. 23, will initially provide information about the showpiece specimens and will eventually cover the gems and other minerals on view throughout the space, said Richard Kissel, the Peabody’s director of public programs. As visitors move about the room new information will be displayed depending on where they are standing, Kissel said. Skelly said the plan is to use the same technology throughout the museum. Skelly said there is the potential to develop multiple channels for the app customized to specific themes or purposes. Kissel said the technology will enable the museum to provide visitors with multiple narratives about the material on view. “Traditionally, a museum has to pick a single narrative and stick to it, but this technology can provide visitors multiple experiences within the same gallery,” he said. The gem and mineral gallery, which was designed by Christopher Williams Architects in collaboration with the Peabody, will also serve as a 126-seat-capacity multipurpose event space to accommodate the more than 300 public programs the museum hosts each year. In celebration of the Peabody’s 150th anniversary, admission to the museum will be free Oct. 22-23 due to a gift from the Lucille and Arnold J. Alderman Fund. 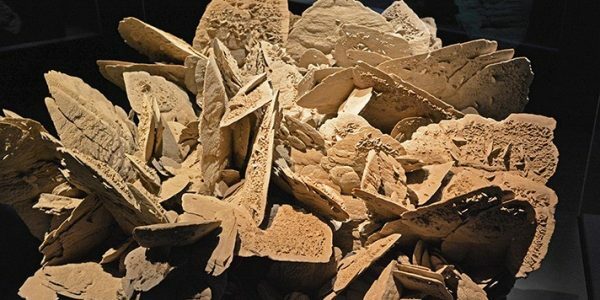 The Peabody Museum, located at 170 Whitney Ave., is hosting a series of programs throughout the year to celebrate its 150th anniversary. Details and a calendar of events are available on the Peabody’s website.